“A man is dying and, as he reaches the point of greatest physical distress, he hears himself pronounced dead by his doctor. He begins to hear an uncomfortable noise, a loud ringing or buzzing, and at the same time feels himself moving very rapidly through a long dark tunnel. After this, he suddenly finds himself outside of his physical body from a distance, as though he is a spectator. He watches the resuscitation attempt from this unusual vantage point and is in a state of emotional upheaval. After a while, he collects himself and becomes more accustomed to his odd condition. He notices that he still has a “body”, but one of a very different nature and with very different powers from the physical body he has left behind. Soon other things begin to happen. Others come to meet and to help him. He glimpses the spirits of relatives and friends who have already died, and a loving, warm spirit of a kind he has never encountered before – a being of light – appears before him. This being asks him a question, non verbally, to make him evaluate his life and helps him along by showing him a panoramic instantaneous playback of the major events of his life. At some point he finds himself approaching some sort of barrier or border, apparently representing the limit between earthly life and the next life. Yet, he finds that he must go back to the earth, that the time for his death has not yet come. At this point he resists, for by now he is taken up with his experiences in the afterlife and does not want to return. He is overwhelmed by intense feelings of joy, love and peace. Despite his attitude, though, he somehow reunites with his physical body and lives. “About a year ago, I was admitted to the hospital with heart trouble, and the next morning, lying in the hospital bed, I began to have a very severe pain in my chest. I pushed the button beside the bed to call for the nurses, and they came in and started working on me. I was quite uncomfortable lying on my back so I turned over, and as I did I quit breathing and my heart stopped beating. Just then, I heard the nurses shout, “Code pink! Code pink!” As they were saying this, I could feel myself moving out of my body and sliding down between the mattress and the rail on the side of the bed - actually it seemed as if I went through the rail – on down to the floor. Then, I started rising upward, slowly. On my way up, I saw more nurses come running into the room – there must have been a dozen of them. My doctor happened to be making his rounds in the hospital so they called him and I saw him come in, too. I thought, “I wonder what he's doing here.” I drifted on up past the light fixture – I saw it from the side and very distinctly - and then I stopped, floating right below the ceiling, looking down. I felt almost as though I were a piece of paper that someone had blown up to the ceiling. I watched them reviving me from up there! My body was lying down there stretched out on the bed, in plain view, and they were all standing around it. I heard one nurse say, “Oh, my God! She's gone!,” while another one leaned down to give me mouth-to-mouth resuscitation. I was looking at the back of her head while she did this. I'll never forget the way her hair looked; it was cut kind of short. Just then I saw them roll this machine in there, and they put the shocks on my chest. When they did, I saw my whole body crack and pop. It was the most awful thing! My being had no physical characteristics, but I have to describe it with physical terms. I could describe it in so many ways, in so many words, but none of them would be exactly right. It's so hard to describe. “[When I came out of the physical body] it was like I did come out of my body and go into something else. I didn't think I was just nothing. It was another body... but not another regular human body. It's a little bit different. It was not exactly like a human body, but it wasn't any big glob matter, either. It had form to it, but no colors. And I know I still had something you could call hands. “I was just amazed. I couldn't believe that it was happening. I wasn't really concerned or worried like “oh, no, I'm dead and my parents are left behind and they'll be sad and I'll never see them again.” Nothing like that ever entered my mind. “Several weeks before I nearly died, a good friend of mine, Bob, had been killed. Now the moment I got out of my body I had the feeling that Bob was standing there, right next to me. I could see him in my mind and felt like he was there, but it was strange. I didn't see him as his physical body. I could see things, but not in the physical form, yet just as clearly, his looks, everything. Does that make sense? He was there but he didn't have a physical body. It was kind of like a clear body, and I could sense every part of it – arms, legs, and so on – but I wasn't seeing it physically. I didn't think about it being odd at the time because I didn't really need to see him with my eyes. I didn't have eyes, anyway. “I heard the doctors say that I was dead, and that's when I began to feel as though I were tumbling, actually kind of floating, through this blackness, which was some kind of enclosure. There are not really words to describe this. Everything was very black, except that, way off from me, I could see this light. It was a very, very brilliant light, but not too large at first. It grew larger as I came nearer and nearer to it. “I got up and walked into the hall to go to get a drink, and it was at that point as they found out later, that my appendix ruptured. I became very weak, and I fell down. I began to feel a sort of drifting, a movement of my real being in and out of my body, and to hear beautiful music. I floated on down the hall and out the door onto the screened-in porch. There, it almost seemed that clouds, a pink mist really, began to gather around me, and then I floated right straight on through the screen, just as though it weren't there, and up into this pure crystal clear light, an illuminating white light. It was beautiful and so bright, so radiant, but it didn't hurt my eyes. It's not any kind of light you can describe on earth. I didn't actually see a person in this light, and yet it has a special identity, it definitely does. It is a light of perfect understanding and perfect love. “I knew I was dying and that there was nothing I could do about it, because no one could hear me... I was out of my body, there's no doubt about it, because I could see my own body there on the operating room table. My soul was out! All this made me feel very bad at first, but then, this really bright light came. It did seem that it was a little dim at first, but then it was this huge beam. It was just a tremendous amount of light, nothing like a big bright flash-light, it was just too much of light. And it gave off heat to me; I felt warm sensation. It was a bright yellowish white – more white. It was tremendously bright; I just can't describe it. It seemed that it covered everything, yet it didn't prevent me from seeing everything around me – the operating room, the doctors and nurses, everything. I could see clearly, and it wasn't blinding. At first, when the light came, I wasn't sure what was happening, but then, it asked, it kind of asked me if I was ready to die. It was like talking to a person, but a person wasn't there. The light's what was talking to me, but in a voice. “When the light appeared, the first thing he said to me was “What do you have to show me that you've done with your life?,” or something to this effect. And that's when these flashbacks started. I thought, “Gee, what is going on?,” because, all of a sudden, I was back early in my childhood. And from then on, it was like I was walking from the time of my very early life, on through each year of my life, right up to the present. It was really strange where it started, too, when I was a little girl, playing down by the creek in our neighbourhood, and there were other scenes from about that time – experiences I had had with my sister, and things about neighbourhood people, and actual places I had been. And then I was in kindergarten, and I remember the time when I had this one toy I really liked, I broke it and I cried for a long time. This was a really traumatic experience for me. The images continued on through my life and I remember when I was in Girl Scouts and went camping, and remembered many things about all the years of grammar school. Then, when I was in junior high school, it was a really big honor to be chosen from the scholastic achievement society, and I remembered when I was chosen. So, I went on through junior high, and then senior high school, and graduation, and up through my first few years of college, up to where I was then. The things that flashed back came in the order of my life, and they were so vivid. The scenes were just like you walked outside and saw them, completely three-dimensional, and in color. And they moved. For instance, when I saw myself breaking the toy, I could see all the movements. It wasn't like I was watching it all from my perspective at the time. It was like the little girl I saw was somebody else, in a movie, one little girl among all the other children out there playing on the playground. Yet, it was me. I saw myself doing these things, as a child, and they were the exact same things I had done, because I remember them. Now, I didn't actually see the light as I was going through the flashbacks. He disappeared as soon as he asked me what I had done, and the flashbacks started, and yet I knew that he was there with me the whole time, that he carried me back through the flashbacks, because I felt his presence, and because he made comments here and there. He was trying to show me something in each of these flashbacks. It's not like he was trying to see what I had done – he knew already – but he was picking out these certain flashbacks of my life and putting them in front of me so that I would have to recall them. All through this, he kept stressing the importance of love. The places where he showed it best involved my sister; I have always been very close to her. He showed me some instances where I had been selfish to my sister, but then just as many times where I had really shown love to her and had shared with her. He pointed out to me that I should try to do things for other people, to try my best. There wasn't any accusation in any of this, though. When he came across times when I had been selfish, his attitude was only that I had been learning from them, too. He seemed very interested in things concerning knowledge, too. He kept on pointing out things that had to do with learning, and he did say that I was going to continue learning, and he said that even when he comes back for me (because by this time he had told me that I was going back) that there will always be a quest for knowledge. He said that it is a continuous process, so I got the feeling that it goes on after death. I think that he was trying to teach me, as we went through those flashbacks. The whole thing was really odd. I was there; I was actually seeing these flashbacks; I was actually walking through them, and it was so fast. Yet, it was slow enough that I could take it all in. Still, the time span wasn't all that large, I don't believe. It just seemed that the light came, and then I went through these flashbacks, and the light came back. It s that it was less than five minutes, and probably more than thirty seconds, but I can't really tell you. “The whole situation developed very suddenly. I had had a slight fever and had not felt well for about two weeks, but this night I rapidly became very ill and I felt much worse. I was lying in bed, and I remember trying to reach over to my wife and say that I was very sick, but I found it impossible to move. Beyond that, I found myself in a completely black void, and my whole life kind of flashed in front of me. It started back when I was six or seven years old, and I remembered a good friend I had in grammar school. I went from grammar school to high school to college, then to dental school, and then right on into practising dentistry. I knew I was dying, and I remember thinking that I wanted to provide for my family. I was distraught that I was dying and yet that there were certain things that I had done in my life that I regretted, and other things that I regretted that I had left undone. This flashback was in the form of mental pictures, I would say, but they much more vivid than normal ones. I saw only the high points, but it was so rapid it was like looking through a volume of my entire life and being able to do it within seconds. It just flashed before me like a motion picture that goes tremendously fast, yet I was fully able to see it, and able to comprehend it. Still, the emotions didn't come back with the pictures, because there wasn't enough time. I didn't see anything else during this experience. There was just blackness, except for the images I saw. Yet, I definitely felt the presence of a very powerful, completely loving being there with me all through this experience. “While I was serving in Vietnam, I received wounds, and I later “died” from them, yet through it all I knew exactly what was going on. I was hit with six rounds of machine gun fire, and as it happened I wasn't upset at all. In my mind, I actually felt relieved when I was wounded. I felt completely at ease, and it was not frightening. At the point of impact, my life began to become a picture in front of me, and it seemed that I could go back to the time when I was still a baby, and the pictures seemed to progress through my whole life. I could remember everything; everything was so vivid. It was so clear in front of me. It shot right by me from the earliest things I can remember right on up to the present, and it all happened within a short time. Ant it was not anything bad at all; I went through it with no regrets, no derogatory feelings about myself at all. “The summer after my first year in college, I took a job driving a large semi-tractor-trailer truck. I had a problem that summer with falling asleep behind the wheel. Early one morning I was driving a truck on a long trip, and I was nodding. The last thing I remember was seeing a road sign, and then I dozed off, and the next thing I knew, I heard an awful scraping and the right outside tire blew out, and then because of the weight and sway of the truck the left tires blew out, and the truck turned over on it's side and went skidding down the road towards a bridge. I was scared because I knew what was happening. I knew the truck was going to hit the bridge. Now, during the period of time that the truck was skidding, I just thought of all the things that I had done. I only saw certain things, the high points, and it was such a real thing. The first thing I remembered was following my father as he walked along the breach; it was when I was two years old. And there were a few other things, in order, from my early years, and after that I remembered breaking my new red wagon I had gotten for Christmas when I was five. I remember crying as I went to school in the first grade, wearing that gaudy yellow raincoat my mother had bought me. I remembered a little something about each one of my years in grammar school. I remember each of my teachers, and a little something that stood out about each year. Then I went to junior high, and got a paper rout, and went to work in a grocery store, and it brought me up to right then, just before beginning my second year in college. All these things, and many others, just flashed across my mind, and it was very quick. It probably didn't last but a split second. And then it was all over and I was standing there looking at the truck, and I thought I was dead, I thought I was an angel. I started pinching myself to see if I was alive, or a ghost, or what. Now, this was the strangest experience because all this time I could see all the doctors and nurses, too, as they worked on my body, but it seemed as if I were a spectator rather than that person – that body – they were working on. I was trying so hard to get through to my doctor, “I'm not going to die,” but no one could hear me. Everything – the doctors, the nurses, the delivery room, the ship, the water, and the far shore – was just sort of a conglomerate. It was all together, as if one scene were superimposed right on top of the other. “I had a heart attack, and I found myself in a black void, and I knew I had left my physical body behind. I knew I was dying, and I thought,”God, I did the best I knew how at the time I did it. Please help me.” Immediately, I was moved out of that blackness, through a pale gray, and I just went on, gliding and moving swiftly, and in front of me, in the distance, I could see a gray mist, and I was rushing toward it. It seemed that I just couldn't get to it fast enough to satisfy me, and as I got closer to it I could see through it. Beyond the mist, I could see people, and their forms were just like they are on the earth, and I could also see something which one could take to the buildings. The whole thing was permeated with the most gorgeous light – a living, golden yellow glow, a pale color, not like the harsh gold color we know on earth. “I was out of my body, and I realized that I had to make a decision. I knew that I could not stay out of my physical body for a very long period of time so – well, for others this is very hard to understand, but for me then it was perfectly clear – I knew that I had to decide whether to move on out or to get back in. “It was a very interesting thing to find out that other people have had the same experience, because I hadn't realized... I am actually happy that I have heard this, knowing that obviously someone else has been through this, too. Now I know I'm not crazy. “At this time – it was before I had gone off to college – I had grown up in a very small town, with very small-minded people, the people I was associated with, anyway. I was a typical high-school fraternity brat. You just weren't “it” unless you belonged to my fraternity. “Since then, it has been on my mind constantly what I have done with my life, and what I will do with my life. My past life – I'm satisfied with it. I don't think the world owes me anything because I really did everything I wanted and I did it the way I wanted to, and I'm still alive and I can do some more. But since I died, all of a sudden, right after my experience, I started wondering whether I had been doing the things I had done because they were good, or because they were good for me. Before, I just reacted off the impulse, and now I run things through my mind first, nice and slow. Everything seem to have to go through my mind and be digested, first. “When I was a little boy I used to dread dying. I used to wake up at night crying and having a fit. My mother and father would rush into the bedroom and ask what was wrong. I told them that I didn't want to die, but that I knew I had to, and asked if they could stop it. My mother would talk to me and tell me, “No, that's just the way it is and we all have to face it.” She said that we all had to do it alone and that when the time came we would do it all right. And years later after my mother died I would talk about death with my wife. I still feared it. I didn't want it to come. But since this experience, I don't fear death . Those feelings vanished. I don't feel bad at funerals anymore. I kind of rejoice of them, because I know what the dead person has been through. “The last thing the light said to me, before I came back to my body, back to life, was – well, what it boiled down to was that he would be back. He was telling me that I was going to go on and live this time, but that there would be a time when he would be getting in touch with me again, and that I would actually die. “At the time this happened I suffered, as I still do, with a very severe case of bronchial asthma and emphysema. One day, I got into a coughing fit and apparently ruptured a disk in a lower part of my spine. For a couple of months, I consulted a number of doctors for the agonizing pain, and finally one of them referred me to a neurosurgeon, Dr. Wyatt. He saw me and told me that I needed to be admitted to the hospital immediately, so I went on in and they put me in traction right away. Dr. Wyatt knew that I had bad respiratory diseases so he called in a lung specialist, who said that the anaesthesiologist, Dr. Coleman, should be consulted if I was going to be put to sleep. So the lung specialist worked on me for almost three weeks until he finally got me to a place where Dr. Coleman would put me under. He finally consented on a Monday, although he was very much worried about it. They scheduled the operation for the next Friday. Monday night, I went to sleep and had a restful sleep until sometime early Tuesday morning, when I woke up in severe pain. I turned over and tried to get in a more comfortable position, but just at that moment alight appeared in the corner of the room, just below the ceiling. It was just a ball of light, almost like a globe, and it was not very large, I would say no more than twelve to fifteen inches in diameter, and as this light appeared, a feeling came over me. I can't say that it was an eerie feeling, because it was not. It was a feeling of complete peace and utter relaxation. I could see a hand reach down for me from the light, and the light said, “Come with me. I want to show you something.” So immediately, without any hesitation whatsoever, I reached up with my hands and grabbed onto a hand I saw. As I did, I had the feeling of being drawn up and of leaving my body, and I looked back and I saw it lying there on the bed while I was going up towards the ceiling of the room. Now, at this time, as soon as I left my body, I took on the same form as the light. I got the feeling, and I'll have to use my own words for it, because I've never heard anyone talk about anything like this, that this form was definitely a spirit. It wasn't a body, just a wisp of smoke or a vapor. It looked almost like the clouds of cigarette smoke you can see when they are illuminated as they drift around a lamp. The form I took had colors, though. There was orange, yellow, and a color that was very indistinct to me – I took it to be an indigo, a bluish color. This spiritual form didn't have a shape like a body. It was more or less circular, but it had what I would call a hand. I know this because when the light reached down for me, I reached up for it with my hand. Yet, the arm and hand f my body just stayed put, because I could see them lying on the bed, down by the side of my body, as I rose up to the light. But when I wasn't using this spiritual hand, the spirit went back to the circular pattern. So, I was drawn up to the same position the light was in, and we started moving through the ceiling and the wall of the hospital room, into the corridor, and through the corridor, down through the floors it seemed, on down to a lower floor in the hospital. We had no difficulty in passing through doors or walls. They just would fade away from us as we would approach them. During this period it seemed that we were travelling. I knew we were moving, yet there was no sensation of speed. And in a moment, almost instantaneously, really, I realized that we had reached the recovery room of the hospital. Now, I hadn't even known where the recovery room was at this hospital, but we got there, and again, we were in the corner of the room near the ceiling, up above everything else. I saw the doctors and nurses walking around in their green suits and saw the beds that were placed around in there. This being then told me – he showed me - “That's where you're going to be. When they bring you off the operating table they're going to put you ion that bed, but you will never awaken from that position. You'll know nothing after you go to the operation room until I come back to get you sometime after this.” Now, I won't say this was in words. It wasn't like an audible voice, because if it had been I would have expected the others in the room to have heard the voice, and they didn't it. It was more of an impression that came to me. But it was in such a vivid form that there was no way for me to say I didn't hear it or I didn't feel it. It was definite to me. And what I was seeing – well, it was so much easier to recognize things while I was in this spiritual form. I was now wondering, like, “Now, what is that that he is trying to show me.” I knew immediately what it was, what he had in mind. There was no doubt. It was that that bed – it was the bed on the right just as you come in from the corridor – is where I'm going to be and he's brought me here for a purpose. And then he told me why. It came to me that the reason for this was that he didn't want any fear when the time came that my spirit passed from my body, but he wanted me to know what the sensation would be on passing that point. He wanted to assure me so that I wouldn't be afraid, because he was telling me that he wouldn't be there immediately, that I would go through other things first, but that he would be overshadowing everything that happened and would be there for me at the end. Now, immediately, when I had joined him to take the trip to the recovery room and had become a spirit myself, in a way we had been fused into one. We were two separate ones, too, of course. Yet, he had full control of everything that was going on as far as I was concerned. And even if we were travelling through the walls and ceilings and so forth, well, it just seemed that we were in such close communion that nothing whatsoever could have bothered me. Again, it was just a peacefulness, calmness, and a serenity that have never been found anywhere else. So, after he told me this, he took me back to my hospital room, and as I got back I saw my body again, still lying in the same position as when we left, and instantaneously I was back in my body. I would guess that I had been out of my body for five or ten minutes, but passage of time had nothing to do with this experience. In fact, I don't remember if I have ever even thought of it as being any particular time. Now, this whole thing had just astounded me, took me completely by surprise. It was so vivid and real – more so than ordinary experience. And the next morning, I was not in the least afraid. When I shaved, I noticed that my hand didn't shake like it had been doing for six or eight weeks before then. I knew that I would be dying, and there was no regret, no fear. There was no thought, “What can I do to keep this from happening?” I was ready. Then the thoughts came to me, from the presence, “Since you are asking for someone else, and thinking of others, not Jack, I will grant what you want. You will live until you see your nephew become a man.” And just liked that, it was gone. I stopped crying, and I destroyed the letter so my wife wouldn't accidentally find it. That evening, Dr. Coleman came in and told me that he was expecting a lot of trouble with putting me to sleep, and for me not to be surprised to wake up and find a lot of wires and tubes and machines all around me. I didn't tell him what I had experienced, so I just nodded and said I would cooperate. The next morning the operation took a long time but went fine, and as I was regaining my consciousness, Dr. Coleman was there with me, and I told him, “I know exactly where I am.” he asked, “What bed are you in?” I said, “I'm in that first bed on the right just as you come in from the hall.” He just kind of laughed, and of course, he thought that I was just talking from the anesthetic. I wanted to tell him what had happened, but just in a moment Dr. Wyatt came in and said, “He's awake now. What do you want to do?” And Dr. Coleman said, “There's not a thing I can do. I've never been so amazed in my life. Here I am with all this equipment set up and he doesn't need a thing.” Dr. Wyatt said, “Miracles still happen, you know.” So, when I could get up in the bed, and see around the room, I saw that I was in that same bed that the light had shown me several days before. 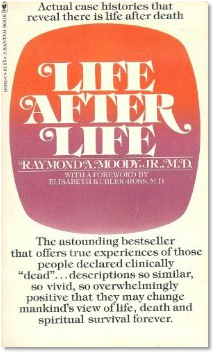 If you would like to hear or find out more about Dr. R. Moody's research on the near-death experiences, you should get his book titled Life After Life. Life After Life is a report on a qualitative study in which Moody interviewed 150 people who had undergone near-death experiences (NDEs). The book presents the author's composite account of what it is like to die.